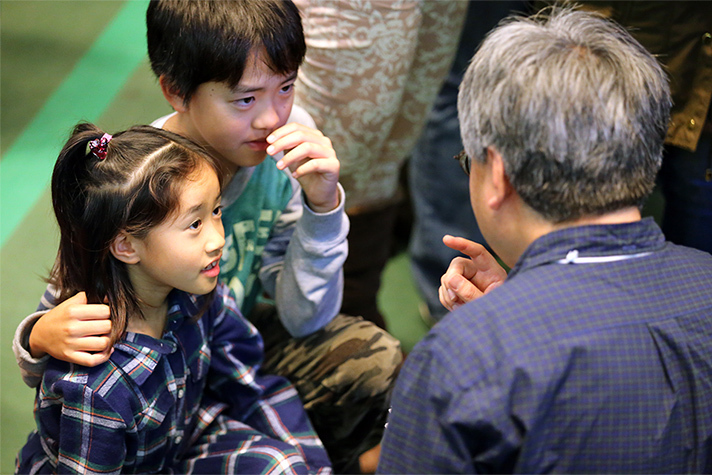 Two children focus intently on what their counselor is saying about asking Jesus into their hearts Saturday night at the Greater Tokyo Celebration of Love. Satou Sakae almost laughed. The question was borderline absurd: How many Christians does he talk to on a regular basis? Let’s see. He works with 20 people at a Tokyo computer company—and he’s the only believer. None of his side of the family are Christ followers. At least there’s one person in his neighborhood—an elderly gentleman who goes to his church of 32 people—who claims Christ as his personal Savior. “I know plenty of people who don’t know Jesus,” said Sakae, a 51-year-old counselor at the Greater Tokyo Celebration of Love. One small problem, though. Sakae had never had real-life training on how to share his faith. In many Japanese churches, that job mainly rests with the pastor. After completing the training provided by BGEA—and while also practicing for the Celebration flash mob during the day—Sakae finally got his chance on Saturday night at the iconic Nippon Budokan. 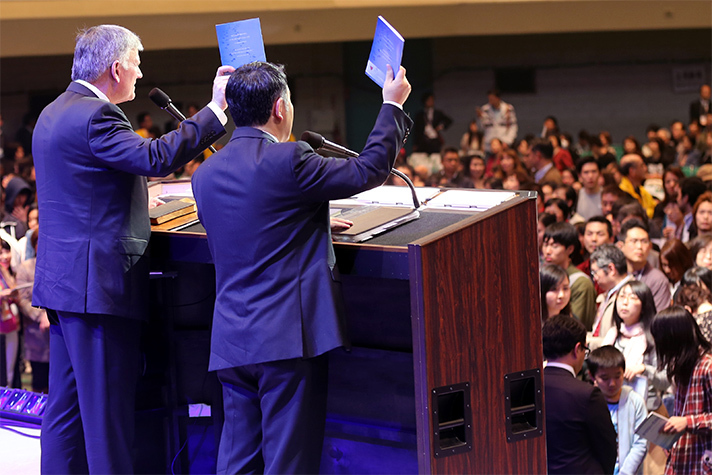 Franklin Graham offers up discipleship materials for every new believer on Saturday night in Tokyo. Hundreds made decisions to follow Christ. Oda, 25, a Christian who brought her infant son, invited her father to come hear Franklin Graham share the Good News. And when it came time for the invitation to receive Christ, he got “out of his seat,” just as Franklin had urged, along with hundreds of others, some who traversed all the way down from the 19th row of the third deck of seats at the octagon-shaped Budokan. “I think he made a real commitment to follow Christ,” Sakae said after counseling the man. The experience left Sakae encouraged, and at the same time, thankful for a reminder of how far God has brought him. As a young teenager growing up in rural Japan, Sakae was bullied in school, leading him to seriously contemplate suicide. It’s unfortunately a trend that continues to riddle Japanese youth today. But then he started listening to the radio and heard Gospel music and Christian sermons, sparking a personal faith journey so many Japanese never even start, primarily because of deep family roots in Buddhism or Hinduism. Him being the Almighty God of the universe. Hillsong Worship came from Australia to work with U.S.-based BGEA to reach Japanese for Jesus Christ. Those prayers are evident by glancing around the arena Saturday night. This wasn’t just a solemn meeting, reciting a few verses or prayers and leaving unchanged. 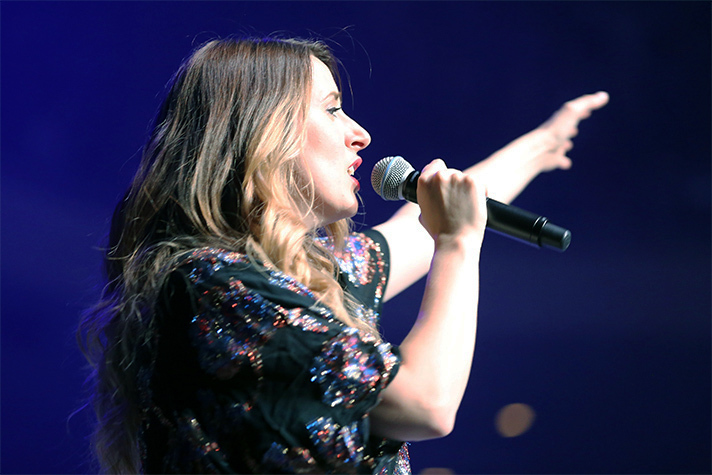 Even some non-believers who left without making a life-changing decision couldn’t stop talking about the worship experience, one they were unfamiliar with until Saturday night. And the powerful words of Franklin Graham, about how real a relationship with Christ can be for anyone who repents, surely planted a seed. The very last thing he told the crowd punctuated the night, almost as if those three syllables are still lingering somewhere in the Budokan air. Choreographed dancing was an integral part of Saturday night’s Celebration of Love. Another 7,000-plus heard the eternal message of hope at a 10:30 a.m. service that featured Franklin Graham preaching the Gospel message centered around the story of Zacchaeus in Luke 19. It was exactly what Mr. and Mrs. Shoji needed to pierce their hearts. Their spiritual journey dates back at least 12 years and goes back to the San Francisco Bay area. An evangelistic meeting to the Japanese community in Walnut Creek, Calif., featured Japanese Rev. Hiroshi Sakakibara, who would often travel from Tokyo to the Bay area to present the Good News. The Shojis still remember that night vividly. It was a Thursday night, with 30 to 40 people meeting in a community center room. The Shojis didn’t make a decision for Christ that night, but later moved to Tokyo. And when Franklin Graham gave the invitation Saturday morning, who was standing up front to greet Mr. Shoji? None other than Rev. Sakakibara, a counselor for the Greater Tokyo Celebration of Love. Both the Shojis made decisions to put their trust in Jesus shortly after noon on Saturday—12 years in the making. Do you want to learn how to share your faith with others? Consider BGEA’s online ReIgnite course.